SUNSET PARK – With recent real estate developments and city investment, it’s clear that the prognostications of residents and politicians about the impending gentrification of Sunset Park were right. Large-scale developments are changing the face of the neighborhood and industrial space are transforming to create new jobs in the area. Last week, Mayor de Blasio announced a $136 million “Made in New York” campaign that looks to bring film, television and media production jobs to a new campus at Bush Terminal. 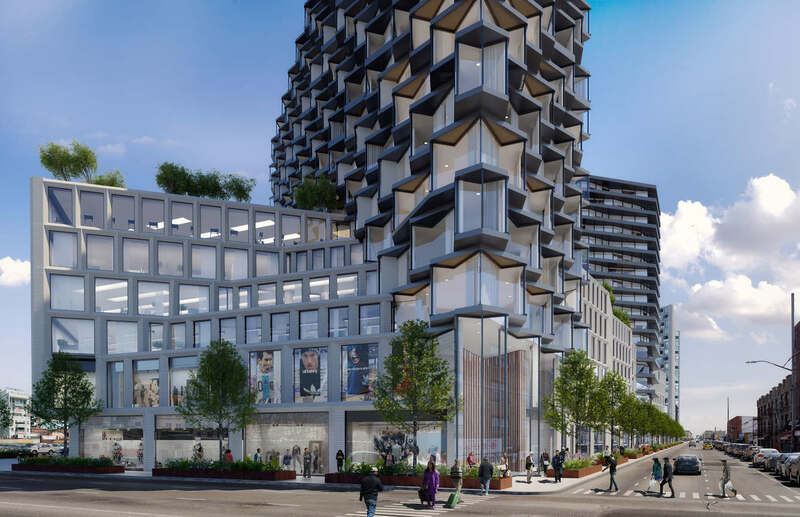 Further inland, a massive retail and residential tower project on the west wide of 8th Avenue at 62nd Street is heading to the City Planning review after a bit of a redesign last year. 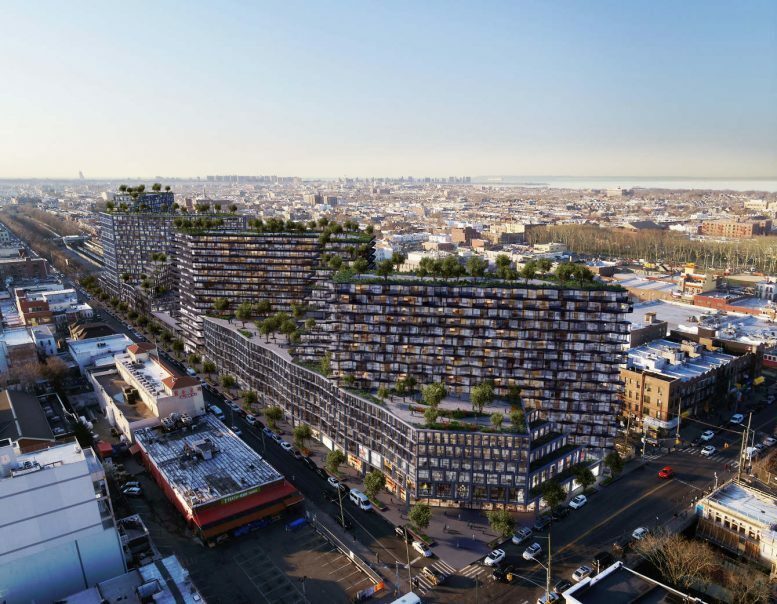 Now, renderings have been revealed for another mega-complex in Sunset Park, this one right across from the first, at 8th Avenue and 62nd, this time on the east side. Renderings are out of the enormous concept, and YIMBY reports that the design would cover a good portion of the currently exposed subway tracks. The N train runs below street level in open air, but the proposal to cover the tracks, much like Hudson Yards did in Manhattan, would reduce the impact of the exposed train on the neighborhood. 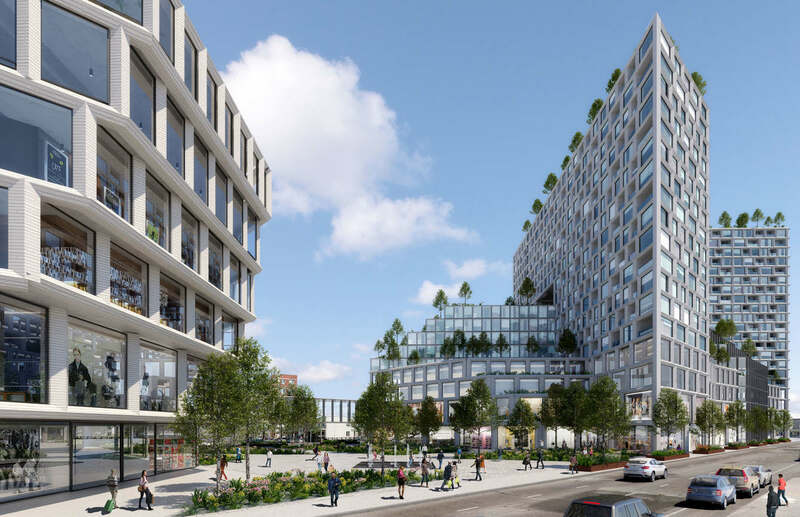 As for the development itself, it would be big: two blocks between 8th and Fort Hamilton Avenues, with 240,000 square feet of lot space alone. While final floor numbers for residences and retail haven’t been determined, the project could easily surpass one million square feet of buildable space. 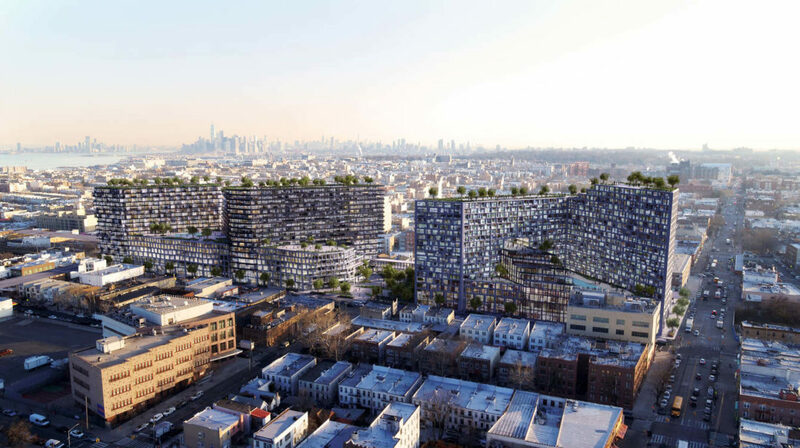 While it’s still early in the game, and permits are far from filed, the writing is on the wall for Sunset Park, and serious undertakings from groups like New Empire Real Estate Development, the company behind this ambitious build-out, will be the new normal. How the Community Board, City Planning and the neighborhood as a whole react remains to be seen, but the money is here and the buildings will soon follow. This is a nightmare that will ruin every bordering neighborhood. People need to mobilize and show up at the upcoming CB meetings!!!! Such a shame. I am sad for Brooklyn. What a great move! Sunset park just keeps climbing! OMG, this looks like mid Wilshire Los Angeles. Perfect place for large-scale development – directly over an open subway line meaning nothing needs to be demolished; steps from the subway stop, where higher density is appropriate, and in the middle of an extremely high-density, mixed income Chinese community that could really use additional housing options. A disaster, to be sure, but there is no stopping development. The fact is, people don’t care THAT MUCH about what NYC looks like. They will pay through the nose to live here no matter how ugly it is. (I cannot explain this behavior, but it is well documented.) So yes, wring your hands and voice your outrage….and get ready for plenty more development in the future. 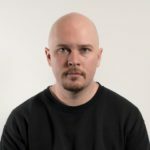 I am from Sunset Park born and raised the only issue I see with this is more traffic less parking which is already an issue takes me sometimes over an hour to find a parking and how will this benifit an over crowded community already. Looks out of place in that neighborhood with mostly stores, apartments above stores, 2 family houses. It is so overcrowded now can’t wait to see what it will become. Yes places change but lets keep the landscape. This is insanity – unless each building has indoor parking for every unit built. Thats a lot of .99 cent stores.